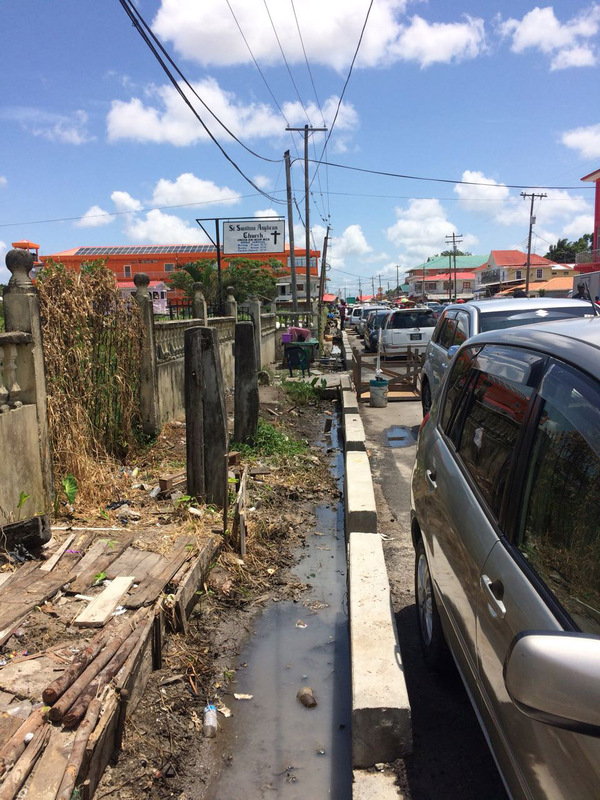 Dozens of Vreed-en-Hoop vendors, who sold along the stelling road, were removed to facilitate road construction work, Minister within the Ministry of Public Infrastructure has Annette Ferguson said. 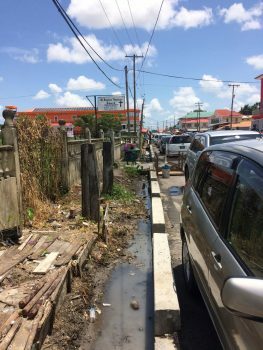 On Tuesday night, workers from the Ministry of Public Infrastructure removed stalls that lined the West Coast Demerara road. This did not sit well with the vendors as many were upset at not being able to vend. This prompted them to travel to the city and seek the intervention of the Ministry of the Presidency yesterday after not being satisfied with the outcome of a meeting with Ferguson on Thursday. The Vreed-en-Hoop to Hydronie road is being improved at a cost of US$46.4 million and the project is expected to be completed by early next year. Yesterday, some of the vendors told Stabroek News that when they met with Ferguson she suggested they be relocated inside of the stelling to ply their trade. However, the vendors pointed out that it is not an ideal location to garner sales since persons hardly venture into the stelling to make purchases. The area identified by vendors as a suitable vending location. The area identified by Minister Annette Ferguson at the Vreed-en- Hoop stelling for the vendors to be relocated. Ferguson, in a telephone interview, said that the vendors were issued several notices informing them of the road construction work and the need for their removal. “Before our government took office, they were told that they would be relocated to the Pouderoyen Tarmac but they didn’t want to go there and at the meeting I suggested a portion of the stelling,” she explained. “Relocating vendors is not our responsibility, we have to maintain the roads and as a result we have a massive road project ongoing and the vendors are aware of this,” Ferguson said. Vendors yesterday said that they were not disturbing the road works as their stalls were over the drains on the reserve. Dianne Cameron, who is a clothing vendor, stressed that if they take up stall space inside the stelling, they would not get sales. “We out here and we barely making something for we self, so imagine when I go in deh I won’t mek any,” she lamented. 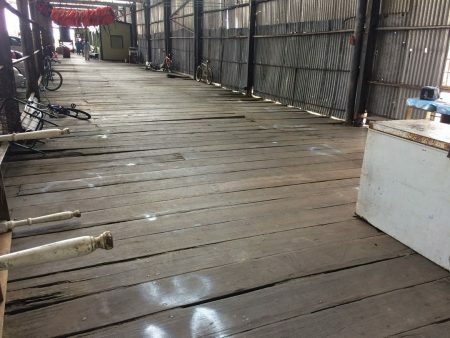 The woman recounted that at around 7pm on Tuesday, the workers showed up and began to break down the stalls. “I had to call my son and he come and we move my stall…,” she said. Cameron added that she has not been able to sell since the disruption. “I have bills to pay and the lil bit money I had used up already because we haven’t been able to sell,” she said. “I don’t know what they are saying that we are disrupting the road works. The road men them does come and tell we when we can’t sell and if we have to move we does move [the stalls], so this makes no sense that we disrupting the road works”, Marlyn Munroe, a food vendor, said. “The area they are putting us to sell is not appropriate for business. The vendors in there does complain of not getting sales, so why we must go in there?” Munroe questioned. Another vendor, Rajdai Jagmohan, said that all they want is five feet on the reserve. “And we will make much with that… Christmas coming and that is when we does get sales and mek we hand… they could allow us to sell until after the season,” she said as she noted that at no time did the road workers complain or inform them that they are preventing the progress of road works. Some vendors, who retail vegetables in their vehicle, said they suffered losses as they were not able to sell. One vendor said he lost more than $66,000 of goods due to spoilage. Vendors want to be allowed to sell along the stelling entrance since it is a hotspot and sales can be garnered easily.